Watery eyes are a common sign of allergies, but it is also a sign of something else? There are certain symptoms that signal whether those watery eyes are allergies or dry eye syndrome (DES). More than 50 million people suffer from allergies every year. Allergic rhinitis, also referred to as hay fever, can cause watery eyes along with sneezing, itchy eyes, and a runny nose. Allergy sufferers often find that they experience these symptoms seasonally. However, up to 10 percent of those who believe they may have allergies, may actually have dry eye syndrome (DES). Dry Eye Syndrome or Allergies? Dry eyes are a common complaint for many people who visit their eye doctor. In fact, almost 5 million Americans suffer from watery dry eyes. Many people that suffer from dry eye syndrome believe that they have allergies. So how can a person tell the difference between dry eye syndrome and allergies? No matter what type of allergen, ragweed, pet dander, or pollen, the eyes react in the same way: redness, itching, burning eyes with clear, watery discharge. Dry eyes also cause eyes that are red, itching, and burning with watery discharge. However, dry eyes are not caused by allergens, but rather problems with tear making glands in the eyes, wind, or even auto-immune disorders. For allergies, many doctors prescribe allergy eye drops because of their extreme success in treating allergy symptoms. However, these same eye drops that bring relief to allergy sufferers can cause the protective layer covering the eye to wash away leading to dry eye syndrome. When a particle gets in or around the eyes, tears are necessary to wash away these foreign bodies. But, excessive tearing can cause watery eyes which can wash away the protective layer that covers the eyes. Epiphora, which means increased tearing, can be caused from the eyes producing more tears than necessary or a tear drainage duct not functioning properly. The lacrimal gland produces the tears that protect the surface of the eye. Located above and behind the upper eyelid, the gland works when we blink, while the eyelid pushes the tears across the surface of the eyes. These tears collect in the lower corner of the eye where they travel through tiny holes to a nasal duct that allows them to travel down the nose and into the throat. At the same time, the lacrimal gland produces new tears and the process continues. This is all an important process that, if interrupted, can cause a person pain, discomfort, and even vision loss. If dry eyes last months or years, dry eye syndrome (DES) is present. Sometimes the symptoms improve but return after some time. When the tear film is washed away due to excessive watery eyes, dry eyes gets worse. There are several reasons people suffer from DES. If the Meibomian oil glands are clogged, the quality of tears is poor (tear not thick with the right mixture of mucin, protein, and lubricants), certain medications cause the eyes to become dry, or even environmental factors cause a disruption to the tear film, DES can be present. It is vitally important that the eyes are able to produce their own natural tears to protect the eye surface. If the cornea becomes damaged from a lack of a protective tear film, vision loss may occur. Whether the need is increasing tears, maintaining tears, triggering tear production, or healing inflammation in or around the eye, TheraLife can help. 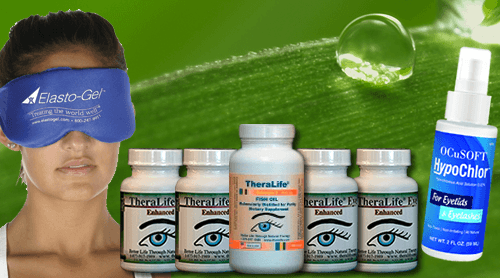 As a leader in chronic dry eye treatment, TheraLife allows the body to produce tears naturally by promoting the production of the body’s own balanced healing tears. Eliminate painful inflammation and dryness and restore your own comfortable vision. Lengthy doctor visits, eye drops that don’t work, or expensive medicines do not address the root cause of the problem which is underactive tear production. Try TheraLife today for your dry eye treatment and begin your journey to healthy happy eyes.